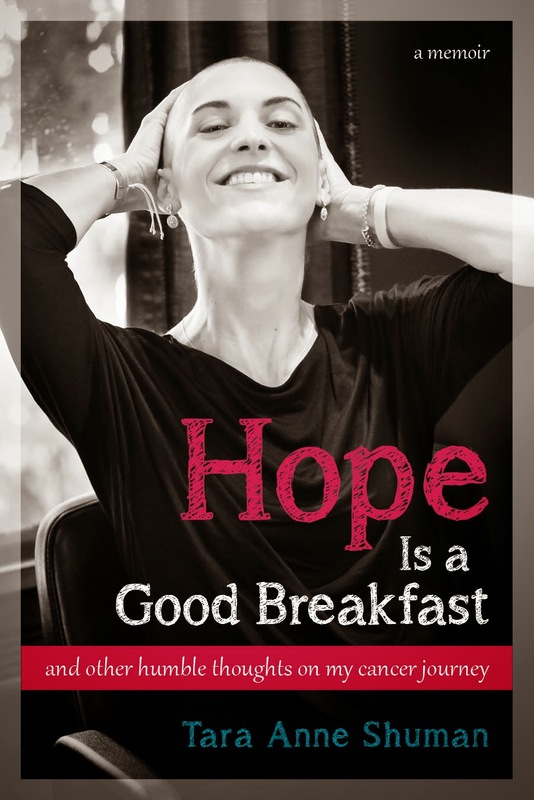 Hope Is a Good Breakfast - The Blog: "Powered by Optimism"
As I wait (im)patiently for my skin test on Tuesday, I have been relatively calm. There have been tough moments, fleeting seconds of doubt, but they are just that -- moments, and fleeting. For the most part, I have kept loyal to the beliefs that have helped me most up to this point including, most of all, the thought that I am here now. As anxious as I am for time to move quickly, I've tried to enjoy the present and for the most part, I have. Especially last night. Because last night, as the snow fell and the wind whirled, we celebrated the news that Brianne and Seamus are having a baby boy. More importantly, we celebrated that the little guy is nice and healthy in Brianne's barely pregnant-looking stomach. It is so cool to watch my best friend experience the happiness that Brian and I have had twice already. Especially because no one was more giving or selfless while we were experiencing that happiness than Brianne and Seamus were. She didn't even cry, and at one point we asked the doctors if she was OK because she was so quiet. "She's great," they told us. She really was. Given her age, Annabel won't remember anything about me having cancer. But Teddy is three years older, and his memory is truly remarkable, so I know he will. I try to think about how this process is affecting him but I really don't have any clear answers. On the one hand, I don't see how it has affected him in any negative way. If anything, it may have even improved his already pretty sweet childhood lifestyle. But when he has tough days full of temper tantrums and time-outs (and we've had several consecutive days of such), I start to wonder if maybe I'm missing something. The other night when we were driving over to the doctor's office for Brian's poison ivy, Teddy asked me, Mommy, why is the whole world doing things for you? I looked at Brian speechless. I couldn't lie, mainly because I couldn't think of one. Because I have breast cancer and people like to help people that have cancer. Isn't it so nice of them? He agreed that it was. But as I write out that conversation, I realize that there were a million better things I could have said. I just don't know what they would have been. Still, I sit here marveling at his question. Kids really have an uncanny ability to see so little, yet see so much. Annabel's understanding of my treatment is confined to a few distinct concepts. In the last few days as I have come closer and closer to being shiny-head bald, she is back to exclaiming, "Mommy haircut," a hundred times a day. Now she adds, "I touch," and she rubs my head with a goofy little smile. I tickle her when she gets close and what still could be a sad moment never is. Annabel also loves the mock movie trailer that Sean made me. Every time she catches me at my computer she asks to see "Mommy's doc-tas" and I know she wants to sit on my lap and watch the video. She is fascinated by the faces she sees, including those of my three doctors, and she screams and points at the photo when it appears -- "Mommy's doc-tas! Mommy's doc-tas!" I'd like to think she's a child genius, already keenly aware of who's working hard to keep me around for her, but the far more likely reason is that she hears the word "doctor" way too much. At least doctors make her scream with excitement. Better than screaming with fear, I guess. As much as I've tried to take one day at a time, I can't help but think about next Tuesday. For me, that day is up there on the short-list of most important days in this whole treatment process. Because it's then that we'll watch to see what the Taxotere does under my skin to determine if I can go on with the treatment regimen that we thoughtfully chose. I have no idea what exactly I'll be hoping for -- minimal rash, perhaps? I wonder how long we wait there until the doctor tells us the verdict. Just like I did the day before Round One, again, I'm just hoping for a green light. I'm not superstitious, but Brian and I have gotten into a routine of dressing Teddy in a Life is Good shirt that says, "Powered by Optimism," on days that I have an important doctor's appointment or procedure. I've always considered myself an optimist, but I have to admit that lately, my optimism has been put to the test. Because it's really scary to hope for something that you really, really want. Before my surgery, I didn't even let myself fully process the feeling of desperate hope that my cancer hadn't spread. I didn't allow myself pure optimism, at least in the short run. I assumed that it had spread (since I felt that it had spread, and all) and I focused my optimism more on the big picture -- that no matter where it had gone, I could still beat it. Now I'm in a similar situation, but I realize more of the intricacies today than I did before. I desperately hope that my reaction, or lack thereof, allows me to continue with the Taxotere. But I am cautious with that hope and optimism because I also know what frightening disappointment feels like. I really don't want to be blindsided again like I was by my allergic reaction, or like I was by cancer, for that matter. In lots of ways, it must be way easier to be a pessimist. If one expects bad things, disappointment isn't really possible. But that must not be fun at all. Especially because it must be difficult, if not impossible, to expect bad things while hoping for the best. It's hard to be cautious about optimism. I think there's a fine line and I can't say I've found it yet. From what I've seen so far, when it comes down to it, optimists take big risks. Which reminds me of that courage quote by Maya Angelou. It definitely takes some courage to be powered by optimism. I'm hopeful for good results on that stupid skin test, even if it means that I'm setting myself up for a huge disappointment next Tuesday. Luckily, becoming a parent has trained me that way. Because once I got married and had kids, I took the biggest risk of all -- I fell in love with people that mean the world to me. That's a terrifying thing, for sure. But for me at least, it's also as good as it gets. Hi Tara, my sister-in-law, Lauren Nassiff, pointed me to your blog and I wanted to say I'm really enjoying it. I'm a few months ahead of you with my own bc (just finished chemo a couple of weeks ago!). I could not agree more about how important optimism is in getting through this. In my case the cancer had spread (thankfully just to the nodes, not beyond), but with great doctors and a big bag of tricks, like you said, we can (and will) still beat this thing. Wishing you the best of luck on Tuesday!